Ooops I forgot to post this page last week - but better late than never! This is my little nephew Logan, REALLY ENJOYING his icecream whilst on a day out with his Granny and Daddy. I've been waiting for a reason to use that robot postcard for ages! The Testimony: I documented a day out. Drips created by spraying very close to the page with Mister Huey Opaque White. Hope you like it - thanks for looking! Well, after a very very busy bank holiday weekend I have finally Tidied My Room - with a lot of help from my lovely hubby John. We got started clearing the room on Saturday morning and finished on Monday evening, by which time we were limping around like a couple of old crocks hurting in places you wouldn't even think of! It's amazing how the contents of that one small room managed to fill the entire bedroom and the bathroom and somehow it took a lot longer to put it all back! Would you like a peek inside? plus 1", 2" and 3.5" drawers. The storage units came from Storage4Crafts - see details on previous post - to my huge relief they fitted exactly where I had planned and we are delighted with the quality, so it was worth the wait. The instructions were not the best, but once you've done one unit it gets easier and we worked together very harmoniously - in fact we actually enjoyed it (couple of oddballs that we are). There were also a couple of inexpensive shelf units from Sainsburys - these went together in less than half an hour and we were very impressed with the quality, the instructions and a clever little plastic widget that came with the fittings and is designed to help you place tacks accurately without hammering your thumb - excellent! More drawers (which you can arrange as you like), plus my ancient storage boxes - I had SO MUCH STUFF in these! - and a stack of albums. The shelves on the right mostly hold photos, memorabilia, projects-in-waiting and alterable items. This unit is called a "tuckaway" and is designed to tuck under the desk - which will be handy when my sons come to stay as there will now be enough roomfor a camp bed in here. In the RH corner is an old CD shelf unit which now houses mini books. My IPod and an old Ghetto Blaster sit on the window ledge, so I can listen to music or Radio 4 whilst I'm working ( I love Woman's Hour, Desert Island Discs, Gardeners' Question Time ... oh dear, I really AM an old crock). ... all we need to do now is clear my workroom (see previous post to get some idea of what a Big Job that's going to be); carry this lot into the cottage and up the teeny winding staircase; assemble the units; put them in place according to my Master Plan; and put everything away (the fun part). You can just make out the website in this picture - www.bestcraftorganizer.com - check it out if you want to treat yourself to some purpose-made flexible storage for your creative space. The UK supplier I used was Storage4Crafts.These boxes must be the ones with the plastic shelves and drawers as they were light enough for me to carry - I couldn't budge the others. I thought I would help the driver by unloading these myself, and everything was going well until I realised I had been trotting back and forth with only one button on my shirt done up so everything was hanging out (and I do mean hanging these days) - oh dear. It was a very busy morning - first the Sainsburys order arrived promptly at 9am, followed closely by FEDEX with my craftroom, then Parcel Force with my new external hard drive (haven't worked out what to do with it yet) and a case of Naked Wines (ironically I kept my shirt done up for that one), then good old Nick the Postie with our LoveFilm DVDs and my Graze Box. My order from EveryCraftsAPound has been dispatched and should arrive on Friday. To help you, there is a new set of CSI Coordinates for each Case File - these are fabulous printable downloads which are designed by the talented Michele Singh and they're free to CSI members. The Coordinates for Case File #72 weren't yet available when I made my page ready for the reveal, but they are all archived so I can use them another time. Here's how I solved the case. These wonderful photos show my grandparents during their courtship and I've included lots of symbolic trinkets - birds and bees, crochet, pearls, buttons, the broken cage, the roses, these all had significance in their later lives. I love how Gran looks so young and innocent and Grandpa looks every inch the handsome charmer. Less than a year after this they were married with the first of six children on the way! The Scheme: - I used all the colours. 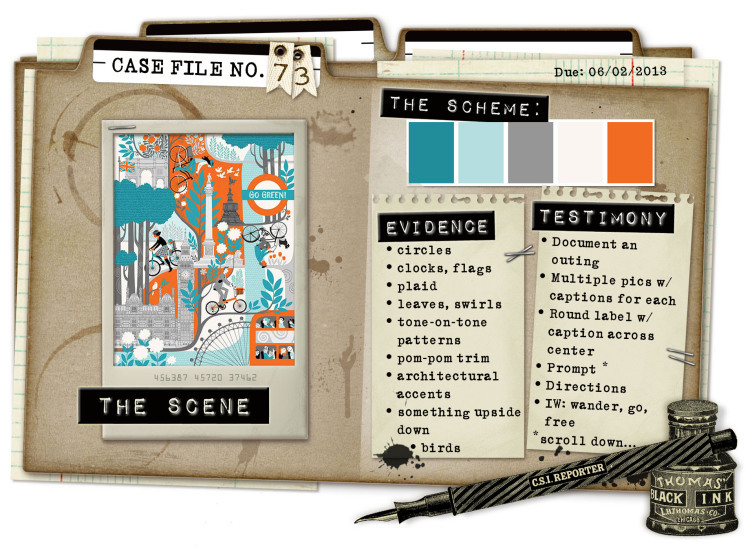 The Evidence: doilies, labels, layered stamping, birds, book pages, bird cage, kraft background, metal. 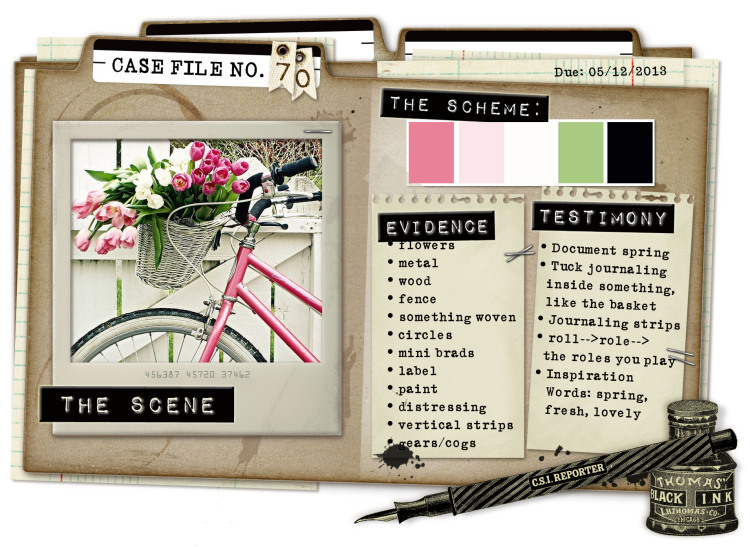 The Testimony: I handwrote my journaling onto a stack of labels. It reads "Granny age 20, so young, sweet and innocent, being swept off her feet by Grandpa, her Prince Charming - handsome and debonair. About a year before they were married. 1934. Surrey. Home made spiral rose made of kraft glassine paper, gilded cherub from 13Arts, the crocheted flowers were from a Papermania Christmas set and the metal clock charm was a holiday souvenir from a bead shop in Suffolk. The background was created with collage tissue and gesso and more Distress Ink. This week I thought I would be crafty and combine four challenges into one layout! 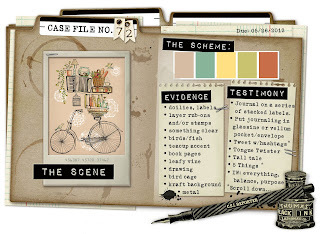 As well as solving CSI Case File #72, I used the sketch by Gabrielle Pollacco for the Scrap365 May sketch challenge. However, it turns out that I can't enter it for that one because the end date is 16th and the CSI reveal date is the 17th and I wouldn't want to let the cat out of the bag too soon! Still, it was a lovely sketch to use all the same and I've tried to emulate Gabrielle's beautiful romantic style as well - quite a departure from my usual style I think, but I really enjoyed he adventure! 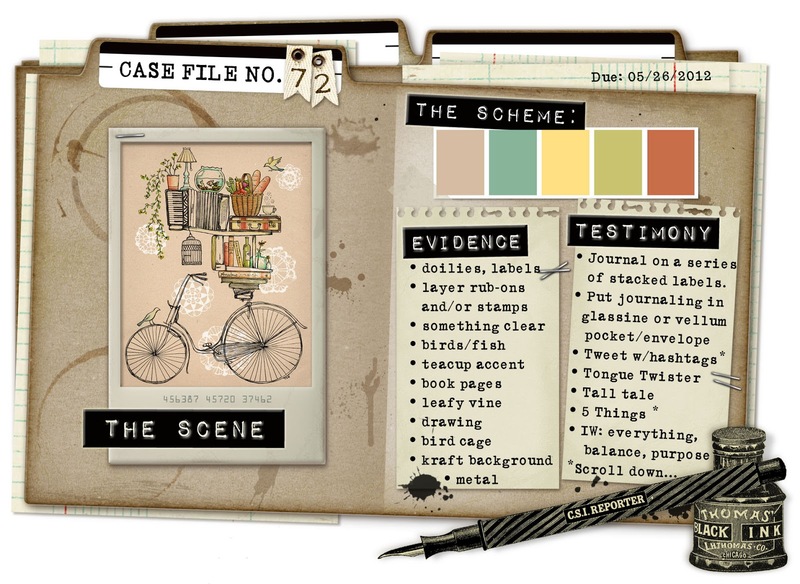 So that's two challenges - the third one is for the final challenge of last weekend's brilliant blog event at Jennifer Grace Creates - this was to create a project inspired by the theme "Free as a Bird" and there is a fantastic prize on offer for the winner. You still have over a week to have a go yourself - check out the gallery at CSI for some amazing inspiration! So anyway, I decided to splurge on some proper storage. I measured up carefully, drew up a plan on squared paper and worked out where everything could go. I bought a couple of cheap extra-deep shelving units from Sainsburys Online which were delivered in less than a week - those will do to house the tubs and some other bulky items. But the best bit is the purpose-built craft storage units from Storage 4 Crafts - it was very hard to choose which combos to go for, but I settled on a mixture of 1", 2" and 3.5" shallow drawers, 12" sloping paper shelves, a desk and a couple of other items which I hope will allow me to make an organised creative space. After a bit of a hiccup due to some parts not arriving from Canada, they finally phoned yesterday to arrange a delivery time and I'm SO excited!!! I gave up trying to sleep and got up at 4.15 this morning - and by 5.30 I had this spelt loaf made from scratch and out of the oven to cool! Stir all the dry ingredients together with one hand, throw in all the water at once, keep stirring to combine everything. Plop the resulting mud pie into a greased loaf tin and bake for one hour at 200c, then take out of the tin and place directly on the oven shelf for another five minutes to finish. As this is the second week of the month, we also have a fab sketch from Emma Stafrace to follow. Scheme: All the colours are there, plus black and a small amount of a deeper yellow as I didn't have quite the right shade in my stash, but we're allowed neutrals and10% of an accent colour so I think I'm ok! Testimony: nothing too complicated this week - but I used a song lyric as my starting point and my handwritten journaling reads, "Bailey doing one of his best flip-top smiles for Nanny Annie's camera!" I used three pp from the Coordinates on a plain white cardstock, inking and doodling all edges. Splats of Chalkboard Glimmer Mist were outlined with fine black pen for emphasis. 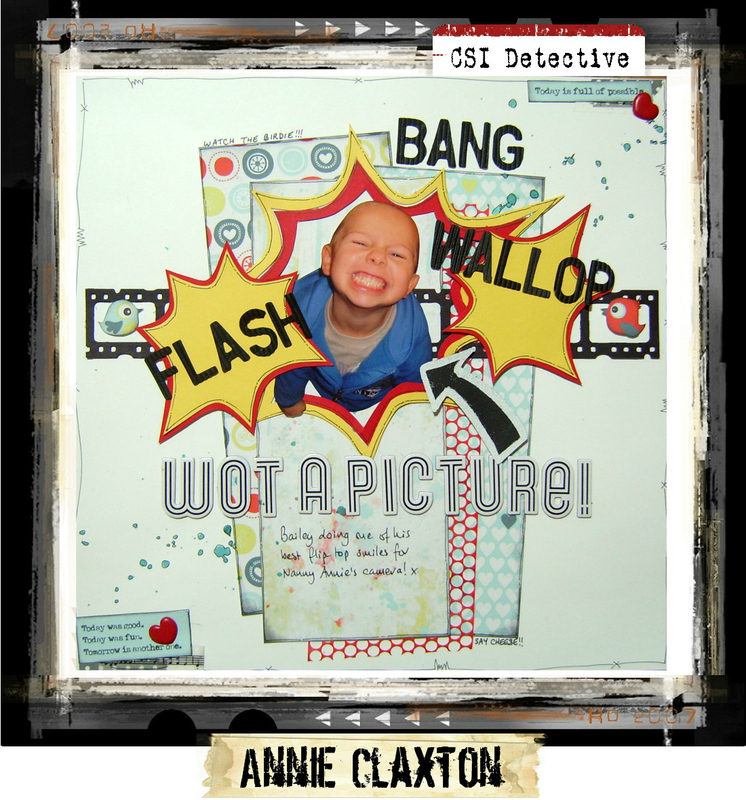 "Flash" shapes were hand drawn and cut from Stampin'Up! card, then doodled around with fine pen. Filmstrip was cut with Tim Holtz Alterations Filmstrip die through my Cuttlebug. Little bird from the Coordinations. Both types of alpha are American Crafts Thickers. 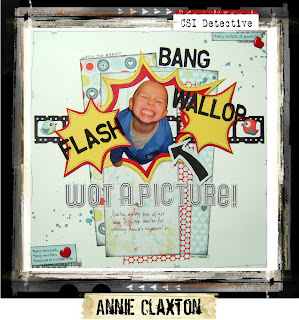 Heat embossing with Stampin'Up! white embossing powder on black card created the chalkboard effect arrow. Quotes from the Coordinates at opposite corners, accented with a heart brad. These two washi tapes were from the Range - two for £3! This is a very Exciting Week for me - my CSI Detective Debut! - and I was away for my first big reveal, so of course one of the first things I wanted to do when we got home was to fire up my PC. CSI Mastermind Debbi Tehrani comes up with a new Scene for us to investigate every week. 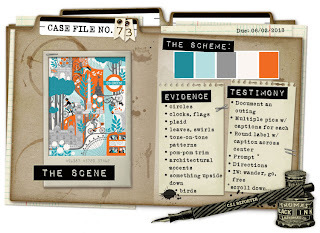 From this image she draws inspiration for colour combinations, design elements and storytelling and these become our design brief - the clues we need to follow in order to solve the case. 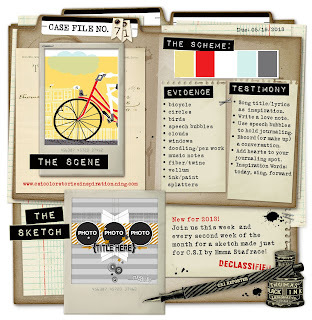 CSI members can also download a new set of CSI Coordinates for each case - these are printable images, journaling spots and pp designed by the lovely Michele Singh - they're so cool! 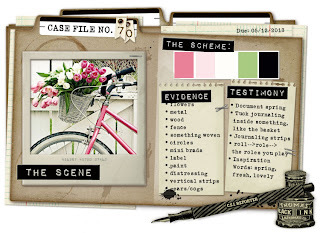 The Evidence: flowers; metal; fence; something woven; paint; distressing; circles; vertical strips. John and I just got home from a long weekend in London and we must be very righteous indeed, because the sun shone on us all weekend! On Monday, we enjoyed a wonderful hop-on, hop-off tour of the city on an open-top London bus - not that cheap at £28 each, but I would totally recommend it as the best way to get a great view of the sights in comfort, without getting sore feet or having to worry about pickpockets! The ticket lasts for 24 hours and during that time you can hop off to find some lunch, visit a museum or whatever, then hop back on again. You can choose a bus with or without a guide who points out all the sights and gives you titbits of history and background information. The price also includes a river cruise (which we didn't do because of my slightly reluctant relationship with water - I think John would have loved to go but he hid it well!). If you ever get the chance to do one of these tours on a sunny day - go for it! Another highlight of our trip was a forage around Camden Lock Market with my son Tom - it was worth it just for the food! Wow! There were so many stalls selling street food from all over the world, it was really hard to choose. But somehow we managed! The boys had Jamaican Jerk Chicken and I had Mexican Corn Bread filled with chicken, guacamole, fried plantain and cheese ... obviously it was NOT a fasting day! YUM! I couldn't believe these were only £10 for THREE! The only problem was trying to decide which to choose. There were some lovely borders as well. The Shopkeeper seemed very friendly and approachable, so I was telling him about my plans to use them for scrapping and art journaling, whereupon he went off and rummaged in a corner and came back with these beautiful 12" square handmade papers - and gave them to me! BTW in the first picture you can also see a copy of "Oh Comely" magazine - I've only recently discovered this whilst looking for something to read in the newsagents at the station, but I love it because it's really different and quirky, even the readers' letters page is not like any other readers' letters page I've ever seen before. Worth the £4 price tag because it's readable from cover to cover and has really cool photos too. They're gorgeous aren't they? They're also fully flexible and just begging for some alteration and elaboration ... they may even end up as unusual residents for one of my Derelict Dollshouses. It was very hard to choose which one to liberate - I think I would have gone for Curly, but as the man offered two for a tenner, John felt it would be rude not to buy her some company, so we rescued Flower as well. You may also have spotted some rescued goodies in the picture which will soon be given a new and greater purpose! All in all, I think you'll agree that's quite an impressive haul. Oh, and I forgot to include in the photograph a jar of delicious Whisky Marmalade and a bottle of Chilli Oil, both home made by my Dad - good job John was carrying just about everything else!